Add elegance and warmth to your Garden or Patio with The LIVIVO ® Round Folding Outdoor Patio Fire Pit. 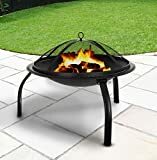 Ideal for use in all Patio areas,Campsites, Beaches or in your Back Garden, this Lightweight but strong portable Fire Pit burns Wood or Charcoal, and can double as a BBQ (We’ll even include a FREE Wooden BBQ Tool). Made from Robust Steel and finished in a stylish looking black heat resistant paint, The LIVIVO ® Round Folding Outdoor Patio Fire Pit is easy to Empty and Clean. It makes outdoor entertaining a breeze and includes a handy mesh cover that prevents ashes from scattering, and a wood grate. Ideal for family get-togethers, parties and chilly Autumn and Spring evenings, this 22″ round fire pit is easy to maintain, and is intended for outdoor use only.